Download "M O N T S E R R A T NO. 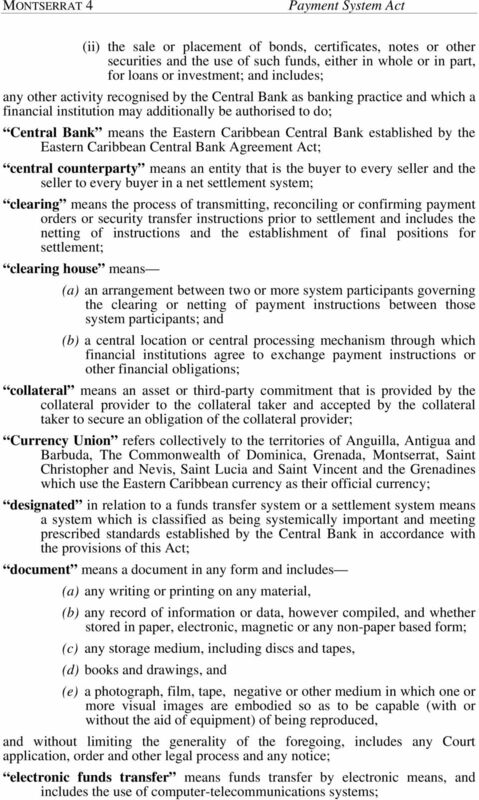 5 OF 2008 PAYMENT SYSTEM ACT 2008 ARRANGEMENT OF SECTIONS PART I PRELIMINARY PART II AUTHORITY OF THE CENTRAL BANK PART III"
8 MONTSERRAT 8 Payment System Act (b) involves or might involve material risks which the Central Bank can abate or help to manage. 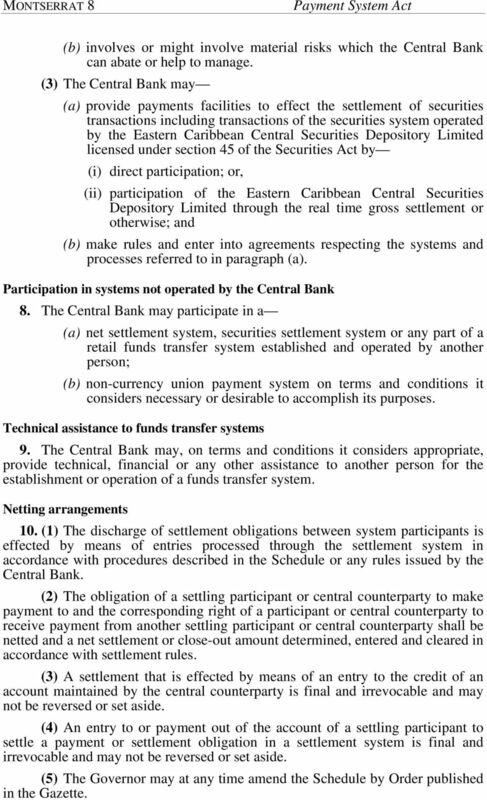 (3) The Central Bank may (a) provide payments facilities to effect the settlement of securities transactions including transactions of the securities system operated by the Eastern Caribbean Central Securities Depository Limited licensed under section 45 of the Securities Act by (i) direct participation; or, (ii) participation of the Eastern Caribbean Central Securities Depository Limited through the real time gross settlement or otherwise; and (b) make rules and enter into agreements respecting the systems and processes referred to in paragraph (a). 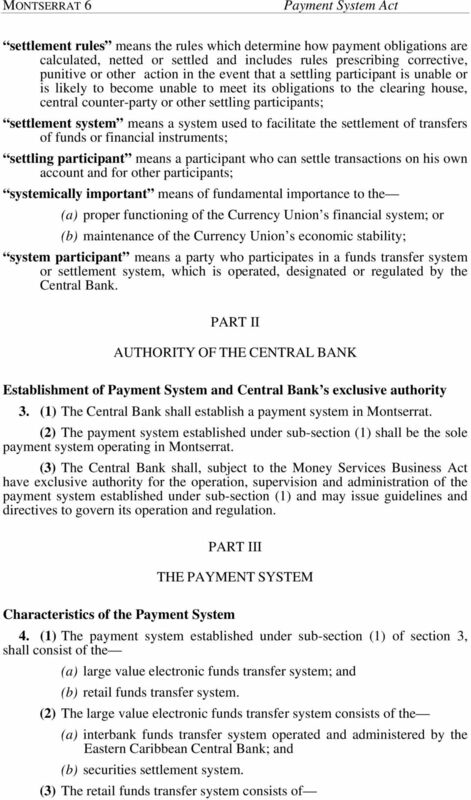 Participation in systems not operated by the Central Bank 8. 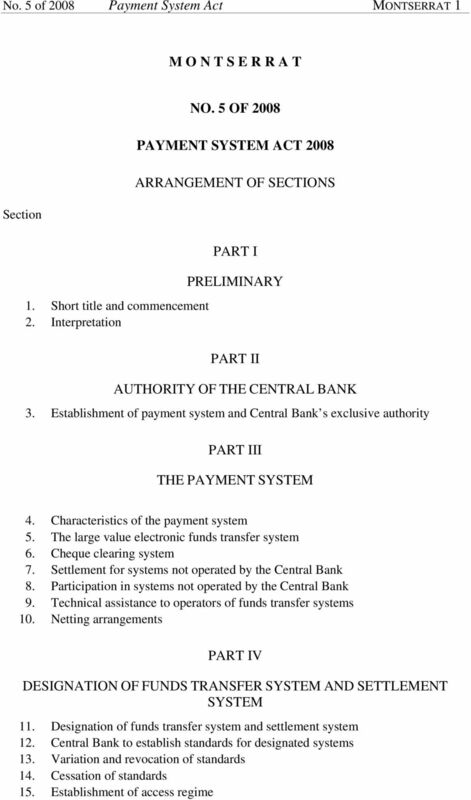 The Central Bank may participate in a (a) net settlement system, securities settlement system or any part of a retail funds transfer system established and operated by another person; (b) non-currency union payment system on terms and conditions it considers necessary or desirable to accomplish its purposes. Technical assistance to funds transfer systems 9. The Central Bank may, on terms and conditions it considers appropriate, provide technical, financial or any other assistance to another person for the establishment or operation of a funds transfer system. Netting arrangements 10. (1) The discharge of settlement obligations between system participants is effected by means of entries processed through the settlement system in accordance with procedures described in the Schedule or any rules issued by the Central Bank. (2) The obligation of a settling participant or central counterparty to make payment to and the corresponding right of a participant or central counterparty to receive payment from another settling participant or central counterparty shall be netted and a net settlement or close-out amount determined, entered and cleared in accordance with settlement rules. (3) A settlement that is effected by means of an entry to the credit of an account maintained by the central counterparty is final and irrevocable and may not be reversed or set aside. (4) An entry to or payment out of the account of a settling participant to settle a payment or settlement obligation in a settlement system is final and irrevocable and may not be reversed or set aside. (5) The Governor may at any time amend the Schedule by Order published in the Gazette. 11 Payment System Act MONTSERRAT 11 (c) voluntary cessation of operations of the designated funds transfer system or designated settlement system; (d) dissolution of the designated funds transfer system or designated settlement system; or (e) revocation or suspension of designation of the funds transfer system or settlement system. Establishment of access regime 15. (1) The Central Bank may establish an access regime for the participants of a designated funds transfer system or designated settlement system. 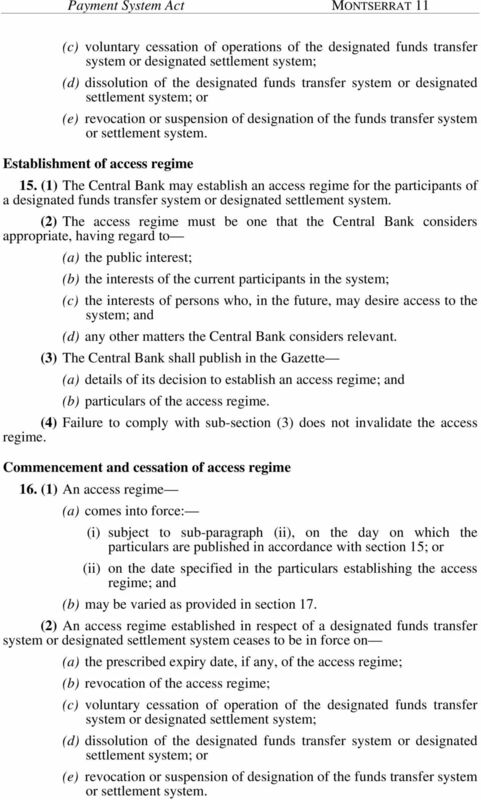 (2) The access regime must be one that the Central Bank considers appropriate, having regard to (a) the public interest; (b) the interests of the current participants in the system; (c) the interests of persons who, in the future, may desire access to the system; and (d) any other matters the Central Bank considers relevant. 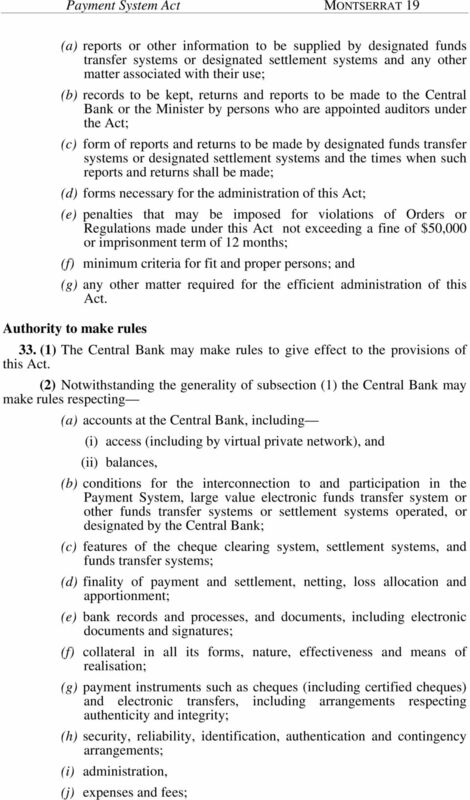 (3) The Central Bank shall publish in the Gazette (a) details of its decision to establish an access regime; and (b) particulars of the access regime. (4) Failure to comply with sub-section (3) does not invalidate the access regime. Commencement and cessation of access regime 16. (1) An access regime (a) comes into force: (i) subject to sub-paragraph (ii), on the day on which the particulars are published in accordance with section 15; or (ii) on the date specified in the particulars establishing the access regime; and (b) may be varied as provided in section 17. 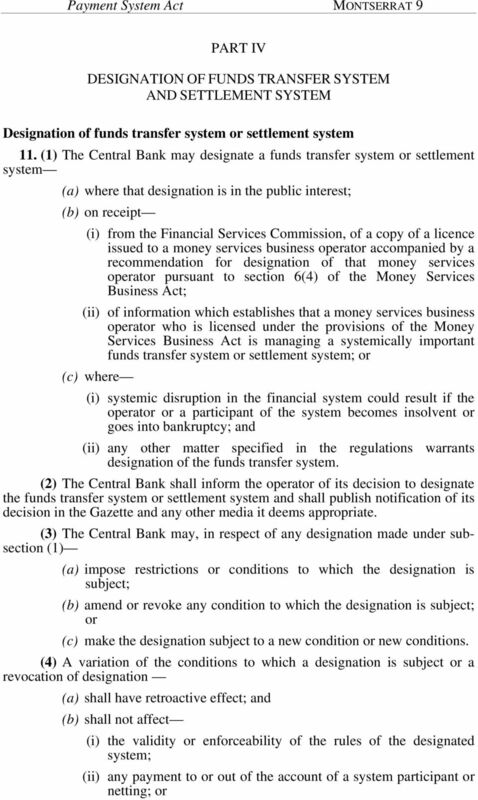 (2) An access regime established in respect of a designated funds transfer system or designated settlement system ceases to be in force on (a) the prescribed expiry date, if any, of the access regime; (b) revocation of the access regime; (c) voluntary cessation of operation of the designated funds transfer system or designated settlement system; (d) dissolution of the designated funds transfer system or designated settlement system; or (e) revocation or suspension of designation of the funds transfer system or settlement system. 12 MONTSERRAT 12 Payment System Act Variation of access regime 17. (1) The Central Bank may vary an access regime if the Central Bank considers it is appropriate to do so, having regard to (a) whether the variation would be in the public interest; (b) the interests of the current participants in the system; (c) the interests of people who, in the future, may desire access to the system; and (d) any other matters the Central Bank considers relevant. 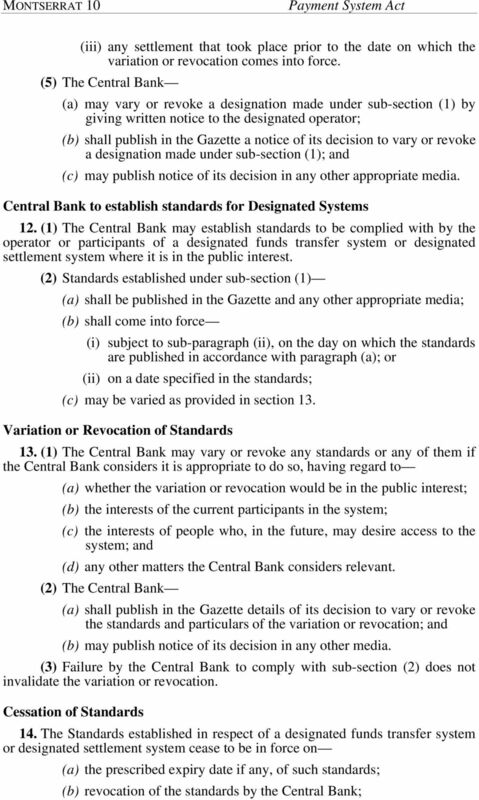 (2) The Central Bank (a) shall publish in the Gazette details of its decision to vary an access regime and the particulars of the variation; and (b) may publish notice of its decision in any other media. 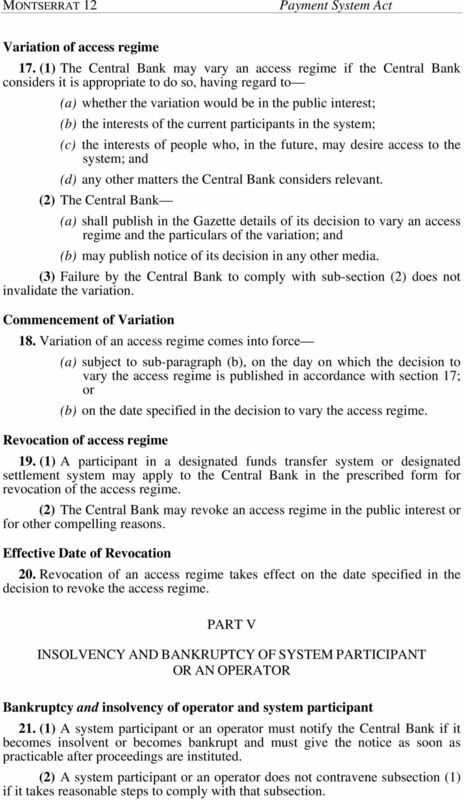 (3) Failure by the Central Bank to comply with sub-section (2) does not invalidate the variation. Commencement of Variation 18. Variation of an access regime comes into force (a) subject to sub-paragraph (b), on the day on which the decision to vary the access regime is published in accordance with section 17; or (b) on the date specified in the decision to vary the access regime. Revocation of access regime 19. (1) A participant in a designated funds transfer system or designated settlement system may apply to the Central Bank in the prescribed form for revocation of the access regime. 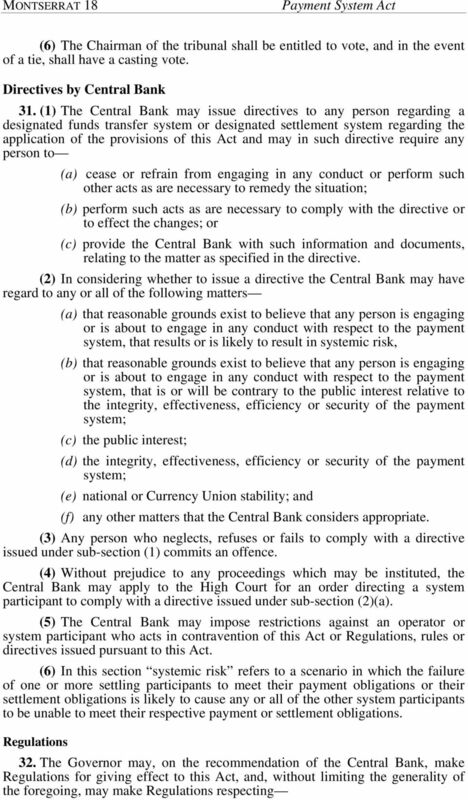 (2) The Central Bank may revoke an access regime in the public interest or for other compelling reasons. Effective Date of Revocation 20. Revocation of an access regime takes effect on the date specified in the decision to revoke the access regime. 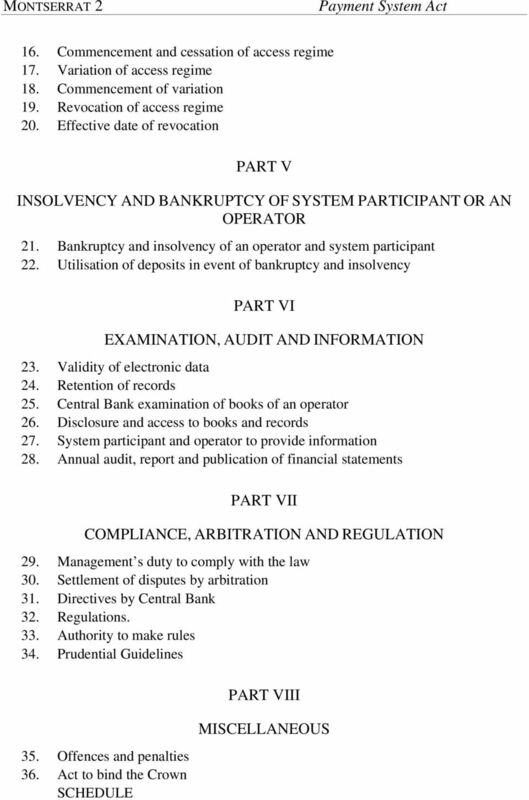 PART V INSOLVENCY AND BANKRUPTCY OF SYSTEM PARTICIPANT OR AN OPERATOR Bankruptcy and insolvency of operator and system participant 21. (1) A system participant or an operator must notify the Central Bank if it becomes insolvent or becomes bankrupt and must give the notice as soon as practicable after proceedings are instituted. (2) A system participant or an operator does not contravene subsection (1) if it takes reasonable steps to comply with that subsection. 13 Payment System Act MONTSERRAT 13 (3) Subject to subsection (2), a system participant or an operator who contravenes sub-section (1) commits an offence. Utilisation of deposits, in event of bankruptcy or insolvency 22. (1) Notwithstanding anything to the contrary in the Bankruptcy Act Cap. the Companies Act or sections 50, 51 and 55 of the Banking Act any asset of a settling participant which is provided prior to the issue of any bankruptcy, winding-up or receivership order against that settling participant to (a) the Central Bank; (b) an operator; or (c) a central counterparty, as security in respect of its payment or settlement obligations, may be utilised by the Central Bank, the operator or the central counterparty to the extent required for the discharge of those settlement obligations of the system participant. 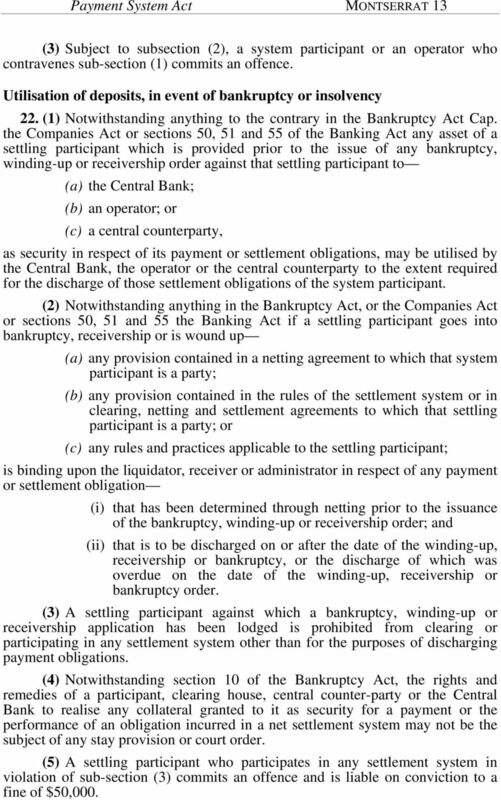 (2) Notwithstanding anything in the Bankruptcy Act, or the Companies Act or sections 50, 51 and 55 the Banking Act if a settling participant goes into bankruptcy, receivership or is wound up (a) any provision contained in a netting agreement to which that system participant is a party; (b) any provision contained in the rules of the settlement system or in clearing, netting and settlement agreements to which that settling participant is a party; or (c) any rules and practices applicable to the settling participant; is binding upon the liquidator, receiver or administrator in respect of any payment or settlement obligation (i) that has been determined through netting prior to the issuance of the bankruptcy, winding-up or receivership order; and (ii) that is to be discharged on or after the date of the winding-up, receivership or bankruptcy, or the discharge of which was overdue on the date of the winding-up, receivership or bankruptcy order. (3) A settling participant against which a bankruptcy, winding-up or receivership application has been lodged is prohibited from clearing or participating in any settlement system other than for the purposes of discharging payment obligations. (4) Notwithstanding section 10 of the Bankruptcy Act, the rights and remedies of a participant, clearing house, central counter-party or the Central Bank to realise any collateral granted to it as security for a payment or the performance of an obligation incurred in a net settlement system may not be the subject of any stay provision or court order. (5) A settling participant who participates in any settlement system in violation of sub-section (3) commits an offence and is liable on conviction to a fine of $50,000. 14 MONTSERRAT 14 Payment System Act Validity of electronic data PART VI EXAMINATION, AUDIT AND INFORMATION 23. (1) Information stored, disseminated or used by system participants and operators shall not be denied legal effect solely on the ground that (a) it is in the form of an electronic record; or (b) it is not contained in the electronic record purporting to give it legal force and validity, but is referred to in another electronic record. (2) Information recorded in electronic format may be produced in evidence in accordance with procedures established in the Evidence Act or applicable law. Retention of records 24. (1) The Central Bank and system participants shall retain records obtained by them during the course of operation and administration of a funds transfer system or settlement system for a period of at least six years from the date of their creation. 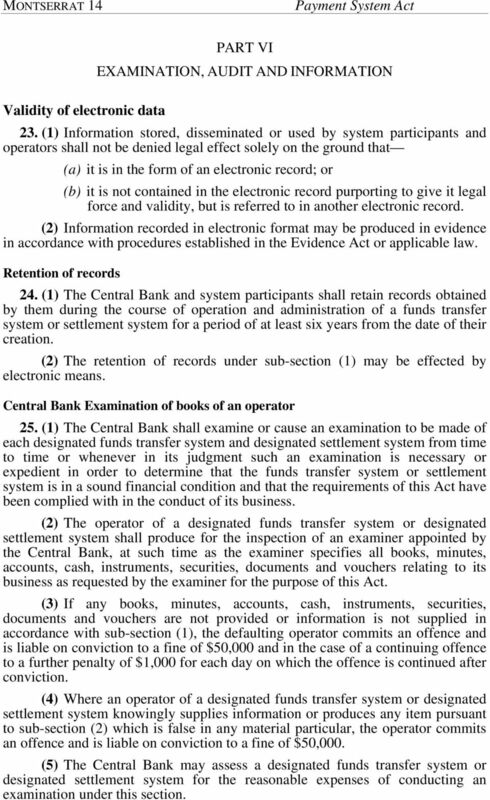 (2) The retention of records under sub-section (1) may be effected by electronic means. Central Bank Examination of books of an operator 25. (1) The Central Bank shall examine or cause an examination to be made of each designated funds transfer system and designated settlement system from time to time or whenever in its judgment such an examination is necessary or expedient in order to determine that the funds transfer system or settlement system is in a sound financial condition and that the requirements of this Act have been complied with in the conduct of its business. 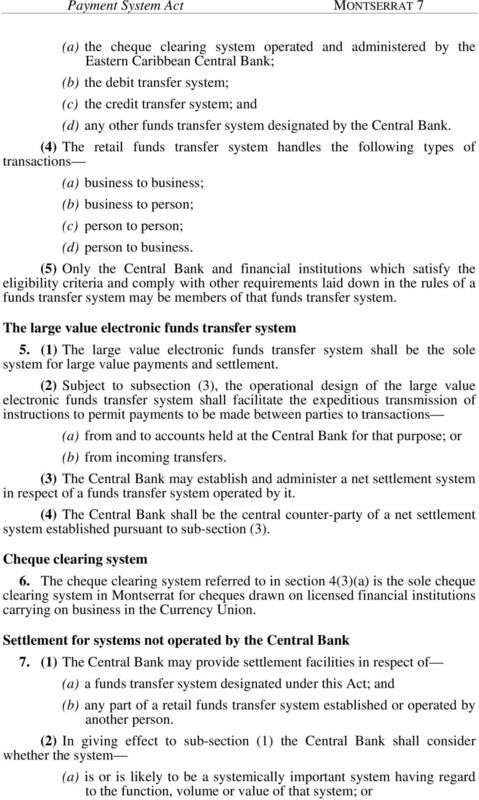 (2) The operator of a designated funds transfer system or designated settlement system shall produce for the inspection of an examiner appointed by the Central Bank, at such time as the examiner specifies all books, minutes, accounts, cash, instruments, securities, documents and vouchers relating to its business as requested by the examiner for the purpose of this Act. 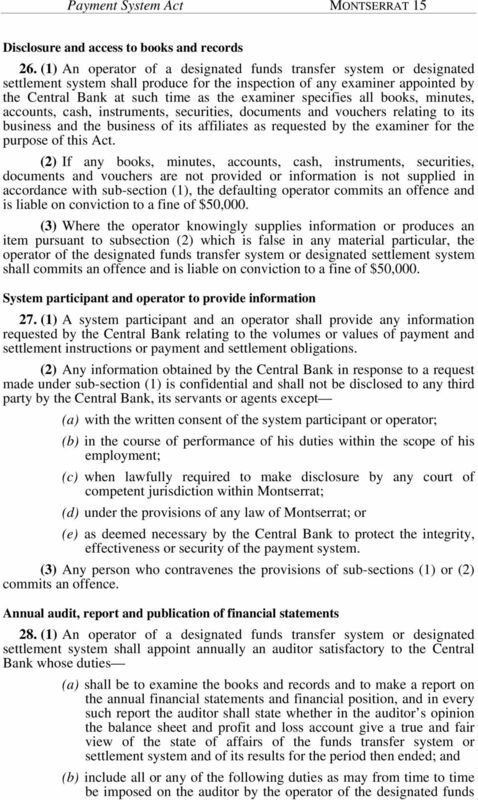 (3) If any books, minutes, accounts, cash, instruments, securities, documents and vouchers are not provided or information is not supplied in accordance with sub-section (1), the defaulting operator commits an offence and is liable on conviction to a fine of $50,000 and in the case of a continuing offence to a further penalty of $1,000 for each day on which the offence is continued after conviction. 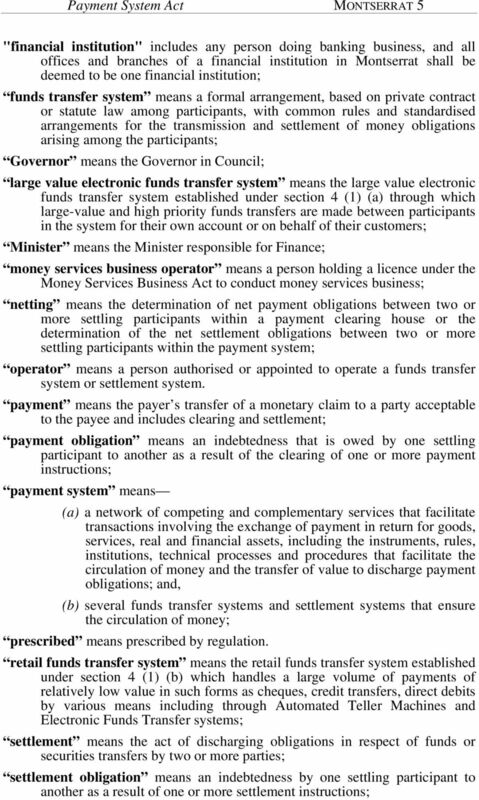 (4) Where an operator of a designated funds transfer system or designated settlement system knowingly supplies information or produces any item pursuant to sub-section (2) which is false in any material particular, the operator commits an offence and is liable on conviction to a fine of $50,000. (5) The Central Bank may assess a designated funds transfer system or designated settlement system for the reasonable expenses of conducting an examination under this section. 16 MONTSERRAT 16 Payment System Act transfer system or designated settlement system at the request of the Central Bank (i) to submit such additional information in relation to the audit of the funds transfer system or settlement system as the Central Bank considers necessary; (ii) to carry out any other examination or establish any procedure in any particular case; (iii) to submit a report on any of the matters referred to in subparagraphs (i) and (ii); (iv) to submit a report on the financial and accounting systems and risk management controls of the funds transfer system or settlement system; and (v)to certify whether suitable measures to counter money laundering and to combat the financing of terrorism have been adopted by the funds transfer system or settlement system and are being implemented in accordance with the Act. (2) The operator shall remunerate the auditor in respect of the discharge by the auditor of all or any of the duties set out in sub-section (1). (3) Where in the course of the performance of his duties an auditor is satisfied that (a) there has been a serious breach of or non-compliance with this Act or any regulation, notice, order, guideline or direction issued under the Act; or (b) there is evidence that a criminal offence involving fraud or other dishonesty may have been committed; the auditor shall immediately report the matter to the operator and the Central Bank. (4) The Central Bank may request copies of reports submitted to the operator by both its internal and external auditors. (5) An auditor shall simultaneously with its report to an investigative, regulatory or other institution on a funds transfer system or settlement system, report to the Central Bank any matter it is required to report such institution. (6) An operator who fails to secure compliance with a request under subsection (1) (b) commits an offence and is liable on conviction to fine of $50,000 for each such failure to comply. (7) If an operator fails to appoint an auditor satisfactory to the Central Bank, the Central Bank may appoint an auditor for such funds transfer system or settlement system and the remuneration of the auditor so appointed shall be determined by the Central Bank and paid by the operator. (8) The Central Bank may appoint an auditor to conduct an independent audit of a funds transfer system or settlement system, in accordance with the instructions of the Central Bank, and to report the findings or results to the Central Bank. 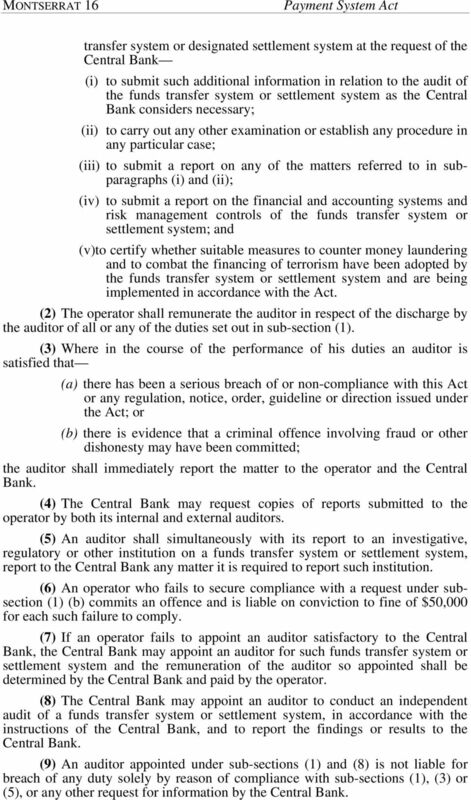 (9) An auditor appointed under sub-sections (1) and (8) is not liable for breach of any duty solely by reason of compliance with sub-sections (1), (3) or (5), or any other request for information by the Central Bank. 17 Payment System Act MONTSERRAT 17 (10) For the purposes of this Act (a) no person having an interest in any funds transfer system or settlement system otherwise than as a depositor and no director, manager, secretary, employee or agent of a funds transfer system or settlement system is eligible for appointment as auditor for such funds transfer system or settlement system. (b) a person appointed as auditor who shall, after an appointment, acquire any interest in a funds transfer system or settlement system otherwise than as a depositor, or become a director, manager, secretary, employee or agent of such funds transfer system or settlement system shall immediately cease to be such auditor. PART VII COMPLIANCE, ARBITRATION AND REGULATION Management s duty to comply with the law 29. (1) A director, manager, secretary or other officer concerned in the management of a system participant shall take all reasonable steps to secure compliance by the participant with the requirements of this Act. (2) A director, manager, secretary or other officer concerned in the management of a system participant who contravenes subsection (1) commits an offence and is liable on conviction to a fine of $50,000 or to imprisonment for a term of 6 months or to both. Settlement of disputes by Arbitration 30. 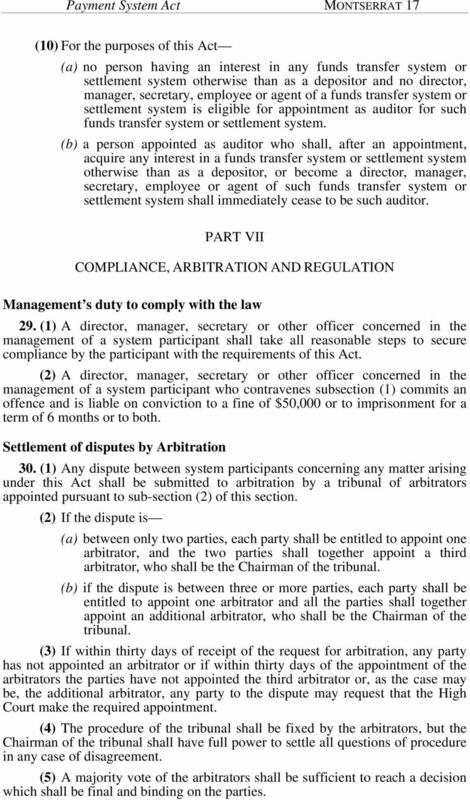 (1) Any dispute between system participants concerning any matter arising under this Act shall be submitted to arbitration by a tribunal of arbitrators appointed pursuant to sub-section (2) of this section. (2) If the dispute is (a) between only two parties, each party shall be entitled to appoint one arbitrator, and the two parties shall together appoint a third arbitrator, who shall be the Chairman of the tribunal. (b) if the dispute is between three or more parties, each party shall be entitled to appoint one arbitrator and all the parties shall together appoint an additional arbitrator, who shall be the Chairman of the tribunal. (3) If within thirty days of receipt of the request for arbitration, any party has not appointed an arbitrator or if within thirty days of the appointment of the arbitrators the parties have not appointed the third arbitrator or, as the case may be, the additional arbitrator, any party to the dispute may request that the High Court make the required appointment. (4) The procedure of the tribunal shall be fixed by the arbitrators, but the Chairman of the tribunal shall have full power to settle all questions of procedure in any case of disagreement. (5) A majority vote of the arbitrators shall be sufficient to reach a decision which shall be final and binding on the parties. 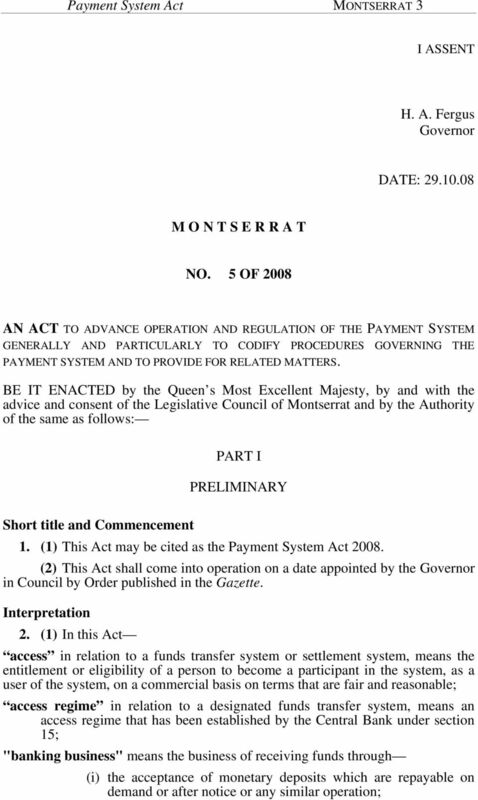 20 MONTSERRAT 20 Payment System Act (k) payment system planning; (l) designated funds transfer systems or designated settlement systems; (m) establishment of a framework for administration of truncated cheques or cheques held either at the institution of deposit or afterwards; (n) alternative dispute resolution machinery; and (o) appointment of auditors. (3) The Rules shall be published in the Gazette. (4) The Central Bank may at any time amend or replace Rules made under this section and such amendment or replacement shall be published in the Gazette or in any other media. Prudential guidelines 34. 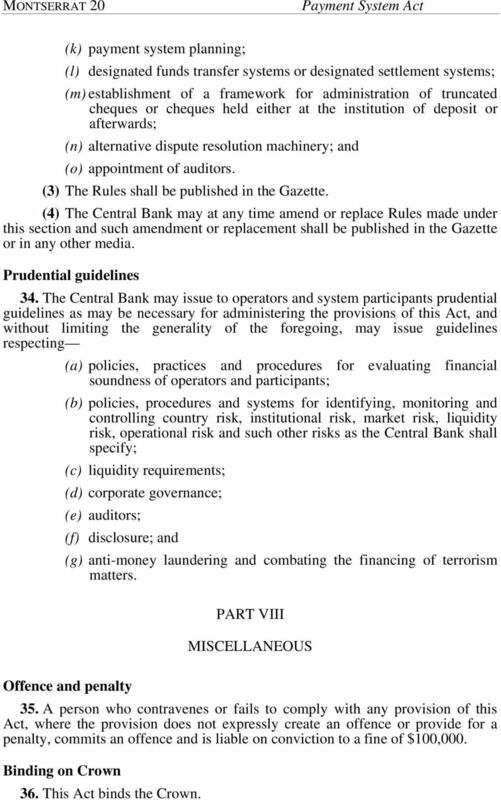 The Central Bank may issue to operators and system participants prudential guidelines as may be necessary for administering the provisions of this Act, and without limiting the generality of the foregoing, may issue guidelines respecting (a) policies, practices and procedures for evaluating financial soundness of operators and participants; (b) policies, procedures and systems for identifying, monitoring and controlling country risk, institutional risk, market risk, liquidity risk, operational risk and such other risks as the Central Bank shall specify; (c) liquidity requirements; (d) corporate governance; (e) auditors; (f) disclosure; and (g) anti-money laundering and combating the financing of terrorism matters. PART VIII MISCELLANEOUS Offence and penalty 35. A person who contravenes or fails to comply with any provision of this Act, where the provision does not expressly create an offence or provide for a penalty, commits an offence and is liable on conviction to a fine of $100,000. Binding on Crown 36. This Act binds the Crown. LAWS OF MALAYSIA Act 276 Islamic Banking Act 1983 Date of Royal Assent Date of publication in the Gazette 9-Mar-1983 10-Mar-1983 An Act to provide for the licensing and regulation of Islamic banking business. CAYMAN ISLANDS. Supplement No. 2 published with Extraordinary Gazette No. 82 of 11th October, 2013. BANKS AND TRUST COMPANIES LAW.